Pros: An innovative set design with immersive multimedia projections, bold lighting and sound. 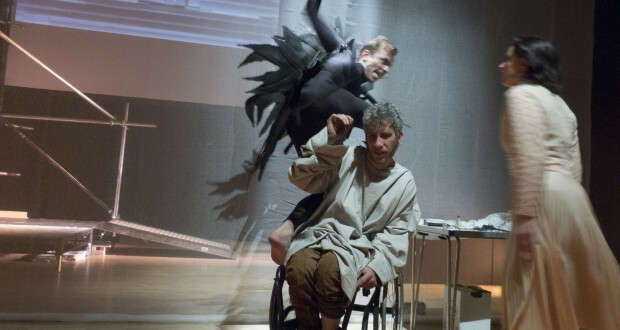 Cons: This is a short play offering an uneasy metaphysical exploration into disability and rebirth. It was at times, overwrought. An ambitious performance offering plenty of visual interest which may be too abstract for some. Metamorphosing was first developed earlier this year by graduating student director Iddo Gruengard, as part of his Central Saint Martin’s Performance Design and Practice course. 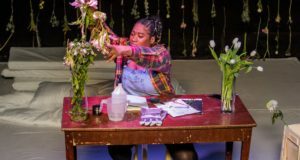 Alongside contemporaries at the Camden Fringe Festival, this latest performance at the Camden People’s Theatre sees it proudly performed as a play in its own right. Drawing on the work of Franz Kafka’s seminal 20th century novella Metamorphosis, this short, 45 minute piece draws strong parallels with the story of Kafka’s main character Gregor Samsa, a travelling salesman who in a nightmarish scenario, wakes to find himself transformed into a monstrous insect. 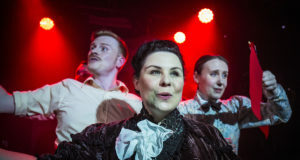 In keeping with the book, the play charts a male lead character’s attempt to physically readjust to a life with a disability and psychologically cope with the crushing realisation that he is a burden to his family. This is a play with little dialogue which relies heavily on physical theatre and live feeds as ever changing multimedia projections display 24 hour style media imagery and recorded mockumentary style snippets. The music, loud and minimalistic, really served to heighten the tension. Throughout the 45 minutes, the main emphasis is on expressive interpretative movement, evoking battles with inner demons and a journey of physiological rehabilitation. For the most part it works well. Black-clad and in insect wings, Leonardo Pancione is especially frightful as Kafka’s Gregor. He even at one point lays upon and almost appears to consume Gruengard’s character who is battling for his life in a hospital bed after an apparent road accident. Almost consumed by his struggle, the lead character eventually comes to terms with paralysis of his legs, accepting solace in his partner and reaching some closure of sorts with the birth of his child. This is a play with a strong central concept. The surrealist Kafkaesque imagery and overbearing sense of threat works well throughout. Though there were several moments which were inadvertently funny, such as the simulation of conception through mechanical props by a doctor figure (played confidently by Jackson D. Kza), as well as the dramatically overzealous labour pains. This is however also a piece that could still use some development. The dialogued sequences seemed incongruous, often verging on the hysterical. 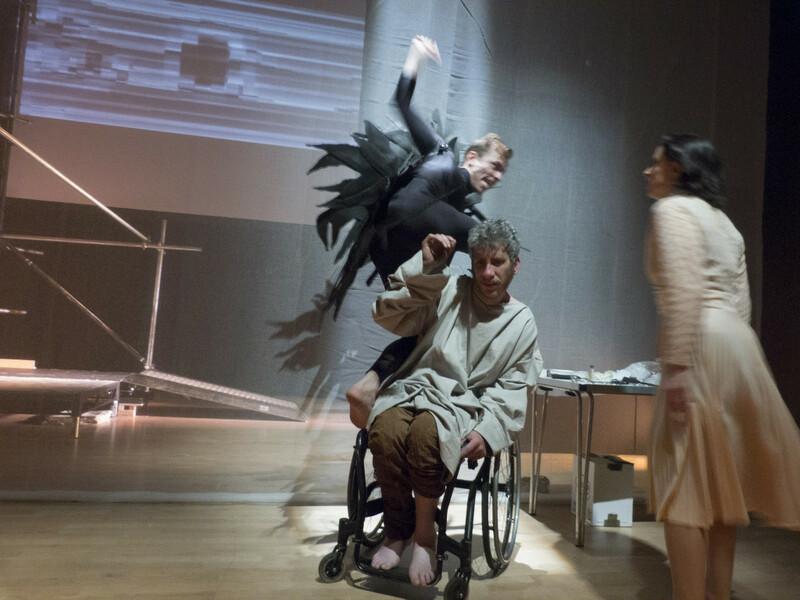 It is perhaps the process of physical rehabilitation and Gruengard’s character’s acceptance of a wheelchair which is the most heartening aspect of this piece. As the character falters and falls, he also comes to regain his strength. We see him becoming more confident as he overcomes the stigma surrounding his disability. Once he becomes a father, he changes the audience’s perception of a character who though disabled, is no less a man. A strange play with bold and ambitious themes. It works well as an allegory about discrimination and finding hope in the face of adversity.